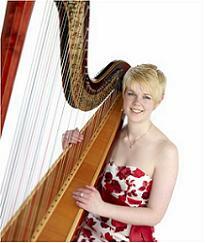 Beautiful harp music, As a stunningly beautiful instrument, the harp is always a welcome addition to the elegance of a wedding. The sound of the harp carries well in even a large room full of guests, and yet is delicate enough not to become intrusive. It provides a gentle background to conversation, and creates a warm and relaxed atmosphere. With a wide repertoire, Lizzie can provide music from a variety of genres, and can tailor her performance to your particular needs. Lizzie is more than happy to consider any special requests you may have, although this is subject to the availability and suitability of the music. Please contact Lizzie to discuss your particular requirements.